The first students to participate in the Gap Experience will graduate in May, and some say they’ll take the tools they earned in their very first semester with them long after Commencement. Peyton Going ’18 hasn’t quite traveled to all four corners of the earth, but with passport stamps from Uganda, Israel, Palestine and the Caribbean, she’s not far off. She says her passion to see the world and experience new things stems from her first semester as a St. Norbert College student – when she forwent the typical college semester and opted instead for an experience that focused on leadership and service. Going was part of the inaugural group in the Gap Experience, a semester-long experiential service-learning program that takes first-year students off campus to build relationships, gain leadership skills, and meet the needs of rural and urban communities, both domestically and internationally. That first cohort of Gap program students will walk across the stage during Commencement in May, and some say they’ll be doing so with new tools and perspectives that can be traced back to their participation in Gap. “I more openly and willingly – maybe it’s just in a different way – seek out ways to get out of my comfort zone, especially through experiential learning,” Going says. 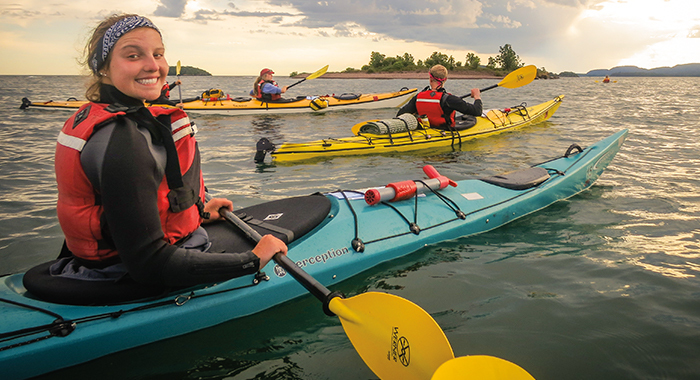 She says that came from the first leg of the Gap Experience – spending a month in northern Minnesota at Voyageur Outward Bound, an outdoor education program. Instead of beginning their college careers on campus, the eight students in the inaugural Gap group spent their first semester developing their leadership and communication skills while backpacking in northern Minnesota and whitewater rafting on the San Juan River in Utah, doing service projects in Chicago and Tennessee, and taking part in a six-week service experience in St. Lucia in the Caribbean. The students began the service portion of the Gap semester in Chicago, working with the Brother David Darst Center, a social-justice education center. Afterward, they headed to rural areas of Tennessee, working with the Once Upon a Time organization. 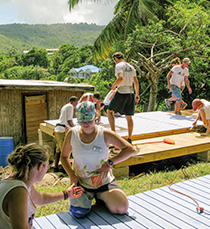 The semester wrapped up with six weeks of service in St. Lucia, where students worked with the Good News Project, an initiative founded by St. Norbert alumni that works to fulfill needs domestically and abroad through service opportunities. Going says Gap’s service work was a formative experience and led her to a major in international studies with a minor in peace and justice. “It definitely introduced me more to having an interest in society and history, and how [the world] got this way,” she says, adding that Gap helped open her eyes to the everyday lives of others throughout the world. Both Going and Beck continued seeking experiential-learning opportunities after the Gap Experience. Going signed up for the Israel-Palestine educational trip the first year it was offered by the Norman Miller Center for Peace, Justice & Public Understanding. Later, she studied abroad for a semester in Uganda. Beck spent a semester studying abroad at University College Cork, Ireland. “I was definitely more prepared to tackle the challenges of studying abroad because of my Gap experience,” says Beck, who plans to pursue a Master of Science in Recreation with an emphasis on recreational therapy at Indiana University. After graduation, Going plans to intern with Voyageur Outward Bound. She is considering where her path will lead her next, but she hopes to work as a facilitator of experiential education opportunities. But, she says, through her experience with the Gap program, she now has the tools and the strength to take that uncertainty head on. The Gap program’s main focus will be on service – including reading scholarly articles and having rigorous, intellectual discussions on service – during the semester-long course. Students will head to Chicago and Albuquerque, N.M., where they’ll look at issues of race, class, culture, ethnicity, gender and immigration, and will take part in a class led by Deirdre Egan-Ryan (English, Academic Service Learning). Fredrickson will lead the course studies when they head to Guatemala, where students will be immersed in the community. “By the end [of the program] they’re really able to critically look at service,” says Diana Delbecchi (Gap Experience). She says immersing oneself in a community is crucial to service: “Often bearing witness and really being present is the best type of service.” This counters most people’s ideas of “traditional” service, such as donating money or clothing and building houses, or “being the white savior,” Fredrickson says. “We can actually be present and learn, rather than assume we know it all already,” Delbecchi adds. Gap participants still will spend the first month of the semester in the boundary waters with Voyageur Outward Bound, where they’ll be physically challenged, but also will develop communication and leadership skills. Sixteen first-years will take part in the Gap Experience in fall 2018. Thirty-five students applied for the program.